December 2018 due to low membership. Beginning in January 2019 I will be teaching Nia for the City of San Jose on Tuesdays through a program similar to the Leisure model. You must register for Nia. A Flex-pass is available $100 for 10 classes. Please contact the community center for details regarding the Flex-Pass. Please note, the brochure is incorrect, THERE IS NO NIA TUESDAY, FEBRUARY 19, 2019! So the session is from 1/8 THRU 3/19. 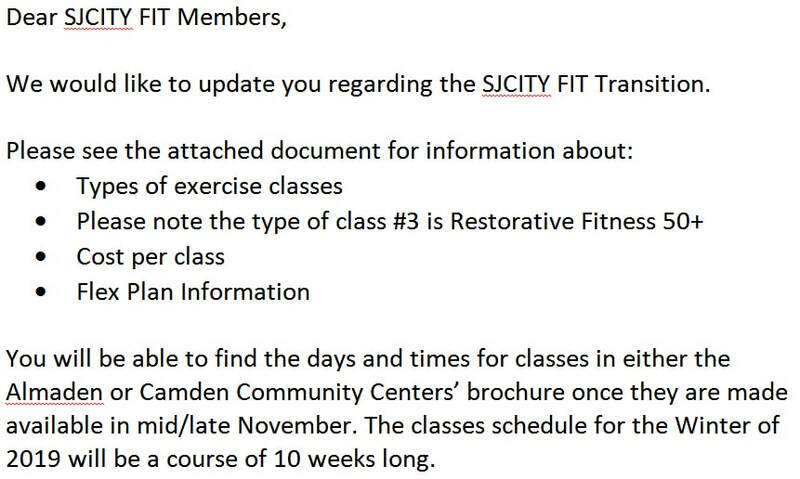 Below is the information regarding the cancellation of the SJCITY Fit Program. The meetings and stuff leading us up to the transition. Town Meeting held Thursday, October 4, 2018. Below that, is an explanation of the current situation. Below that, is the documentation from the input meetings held prior to the Town Meeting. 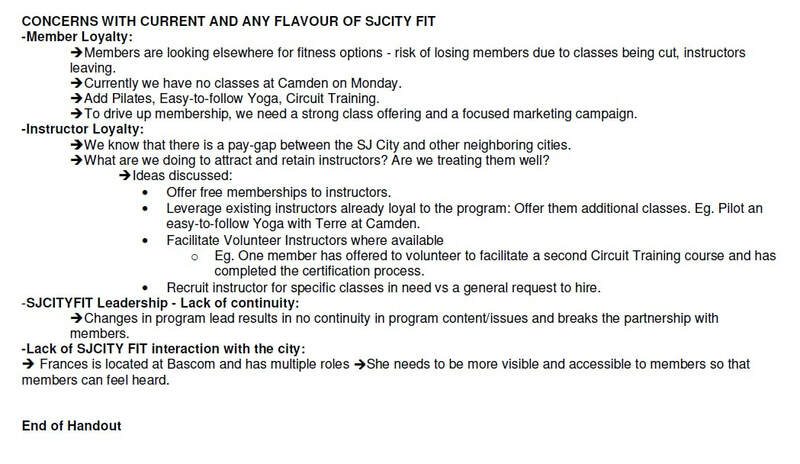 The SJCITY Fit program is being discontinued in December. The city is moving to the Leisure Model. This is just the name of the program. The Parks and Recreation Department has been holding classes under this model for as long as I can remember. It is the model that most people are familiar with. Most people don't even know about the SJCITY Fit Program. This leisure model is where there is a set number of meetings in a “session” and students have to sign up for each session for each class they want to attend. The prices of the sessions for each of the classes will depend on the number of meetings in the session. So each class and each session you sign up for can have a different price and a different number of meetings. The city is also planning on piloting a “flex-plan” so that people who do not want to commit to a class for an entire session don’t have to. 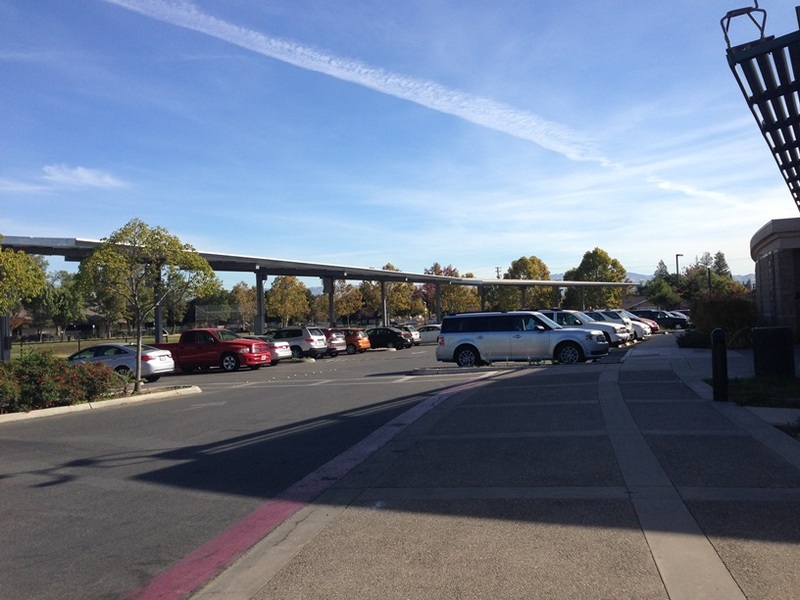 The flex-plan will apply to exercise classes at Camden and Almaden only. Students will have the opportunity to purchase a card with a designated amount of classes that allows them to attend the class they want to attend when they want to, within the season that the card is valid. The flex-plan will be limited by the Leisure Model and subject to the classes that have met the minimum student registration requirement and that are actually going to be held. The flex-plan is being designed to include the exercise classes at Camden and Almaden that are already part of the Leisure Model. The city has set a goal of the end of October in which they will reveal the details of the flex-plan and the fees and dates for the Winter Session. As you may be aware, classes get canceled when they do not have the minimum number of students enrolled, so please do not wait until the last minute to enroll in your favorite classes. As soon as enrollment opens, please enroll. During the initial two seasons, they will be flexible with classes not meeting the minimums and they will not be cancelled, but remember they are always collecting data in regards to registration and attendance. *After the first two seasons, the city will be evaluating everything and there may be changes at that time. We will have to see. ***Beginning in January 2019 I will be teaching Nia for the City on Tuesdays (only) through a program similar to the Leisure model. Below is a sample of a CURRENT class under the Active Adult Leisure Model. 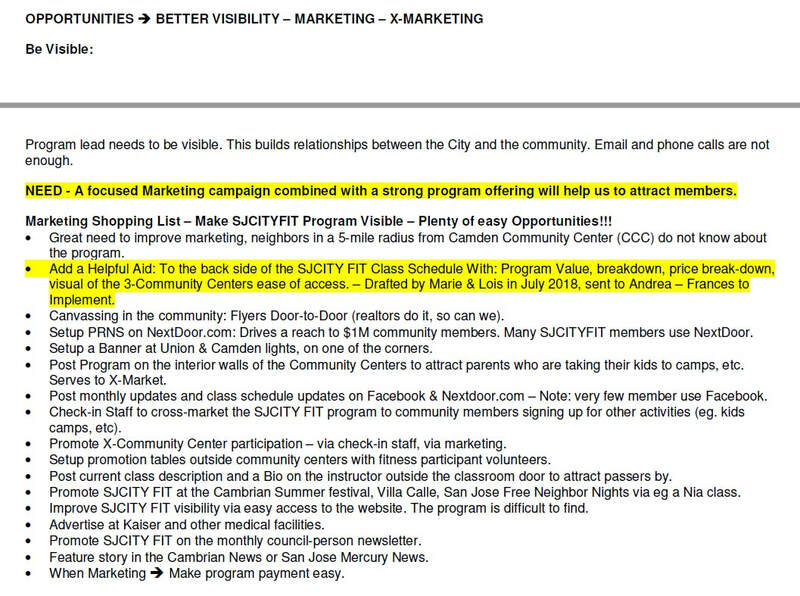 This is just a sample, to give you an idea -- what the SJCITY Fit classes sessions that are migrating to the Leisure Model may look like, I just wanted to give you an IDEA since a lot of you have only taken classes under the SJCITY Fit program. Since we have been told of the cancellation there has been three meetings. 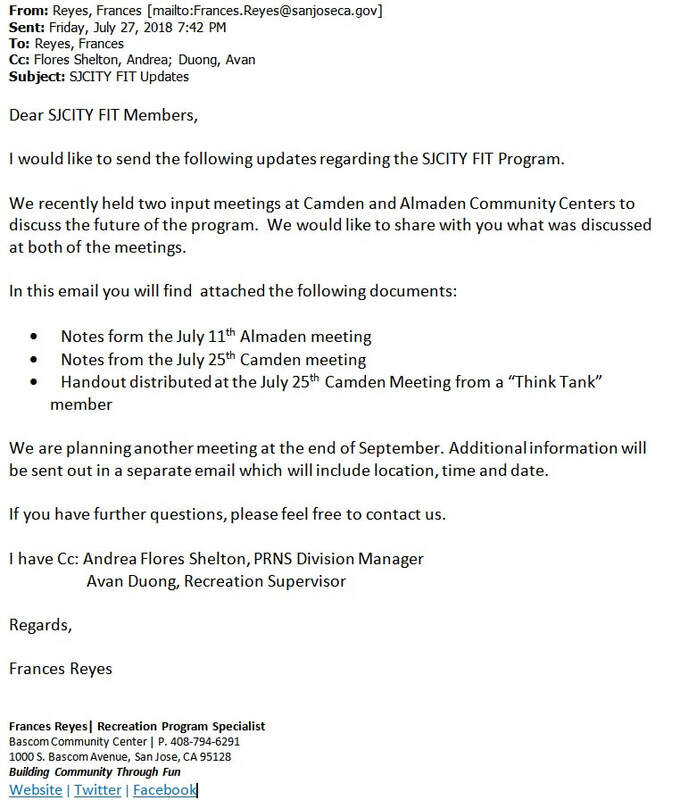 After the first two meetings the Recreational Program Specialist sent out the below e-mail with the notes attached. The notes are below. 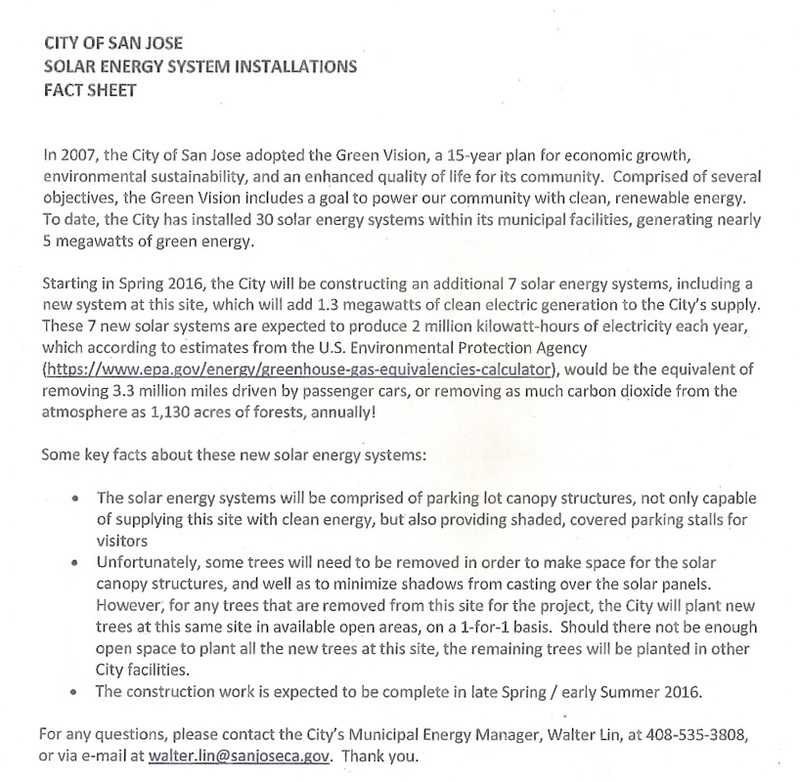 The Think Tank Notes complied by Marie, a SJCITY Fit member, were presented in this meeting. They were ideas that were brought up and discussed in a meeting held March 15, 2018. THURSDAY, AUGUST 16, 2018 at 8:15 PM! The parking project at Camden is done! The Camden Community Center has put up solar parking structures. The project began Monday, May 02, 2016 and was done the second to last week of August. As with most construction projects, this was not done as expected, but I think they did a very nice job of allowing people access to as many parking places as possible. The staff at Camden also helped out during this project by parking in the alternate locations allowing members to use the parking places that were available. Please contact the community center if you have any questions!